2. Modify your default search page. Sometimes your default connection will be pointed at sites that carry adult material or sites that are simply selling something. Another thing these guys do is drop items into your favorites, quicklinks folder and even to your desktop. Most of the time they are simple to fix and simply resetting your homepage will cure the problem, but if they have been really malicious this can be automatically set back to the “Rouge” page by executing code. You can start manually digging through the registry if you wish, but most people will not know where to start, so we are going to need to get help from a third party vendor (don’t panic this wont cost you anything) any of the following can find and remove your problem. OK If the above software didn’t solve the problem then your next step is to download the following piece of software. Well to be honest the best way is stop using Internet Explorer and use another browser like Opera (Free). But seeing as the vast majority of you will be using IE, I’ll give you some pointers. Open your Control Panel and select Internet options or from internet explorer click Tools > Internet options. 2. 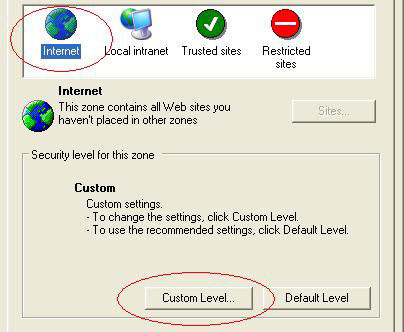 Click Internet then custom level. 3. Click the drop down arrow, select Medium, click reset, then click OK.
5. You will see more options than these I’ve cut the others out, set yours to the same. 1. Download in Install IE-SPYAD this will add a raft of “Known abusers” web sites to your restricted zone, you will still be able to go there but the sites wont be able to abuse you.